A lot of organizations talk about innovation, but MedCentral walks the walk. Not only was it the first hospital in the country to attest to MU Stage 1, but the Mansfield, Ohio-based system also serves as a national showcase site for Siemens. For CIO Mike Mistretta, that means having the opportunity to drive technology and influence usability; however, it also means having to manage expectations and frustrations. In this interview, Mistretta talks about why he enjoys being on the cutting edge — but not the bleeding edge, his “wait and see” approach with ACOs, and the goal to create a unified patient record. He also discusses the work his team is doing with analytics, and how he thinks the CIO role will continue to evolve. There’s still quite a bit of skepticism from the physician side, primarily centered around the productivity loses that they experience when they initially go up on an EMR. The cost models to support that type of exchange are just not sustainable. The pricing that they’re giving to us is for full adoption of HIE, which we quite frankly don’t need. We’re fortunate in that we’re pretty much a sole provider in our corridor right now, so we have the luxury to wait and see where some of the stuff goes. We’re trying to pull the initiatives together. I don’t think people are going to have time to do multiple large initiatives like that unless they’re just an absolutely huge health system. We use consultants periodically, but I’ve also turned down resources if they were not currently employed by the company and were being pulled out of other health systems. So we’ve taken a stand in that space. I only wish more people in the industry would do that. Gamble: And the owned practices are on NextGen? Mistretta: Correct. 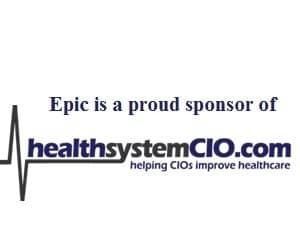 But we are connected through the HIE to about 10 different EMRs to the community practices as well — the affiliated practices. So that data exchange isn’t one way going just to the owned physicians or the employed physicians. Gamble: For the most part, are different systems being used? Mistretta: Yes. Some have eClinicalWorks, Aprima, or GE. There are a multitude of different ones out there that we’re connected to. Gamble: How does that work as far as just trying to coordinate all of that? Is there a group or committee that you have, and are there town hall meetings or those types of things with the community docs? Mistretta: They’re part of the medical staff, so we handle it through the medical staff meetings. I have an outpatient manager who’s responsible for outpatient services who coordinates both the NextGen and the HIE connectivity, and she handles all of the outpatient services and support for the physicians. Gamble: In general, are you happy with the rate of adoption you’ve seen? Mistretta: With the independent practices, I think there’s still quite a bit of skepticism from the physician side, primarily centered around the productivity loses that they experience when they initially go up on an EMR. I wouldn’t say that all of our practices on the community side are fully electronic at this point. The HIE that we provide does give them access to results and things through a portal setting also where they can print things. So the adoption rate from the HIE perspective is fairly high in the community, but as far as electronic exchange, certainly there’s a large area of improvement that can be had there. Gamble: As far as a statewide HIE, is that something you’re participating in at this point? Mistretta: Not today, but we are talking with them. From a state perspective, since we have a regional HIE already in place for the six-county population that we serve, there really hasn’t been a large push to participate at a state level since the bulk of the healthcare that’s provided is local. When we transfer patients for a trauma case or a large cardiac case or something like that that may be a little bit above our capability, that’s where the state would come in. But the frequencies of those is reducing over time so it hasn’t been a big push, but we are talking to them now just to hook in for those types of cases. The biggest issue we’ve experienced is the fact that the cost models to support that type of exchange are just not sustainable. The pricing that they’re giving to us is for full adoption of HIE, which we quite frankly don’t need. We already have our regional setup, so with the few patients I exchange, it’s just not cost effective with the pricing that they’re offering. Gamble: As far as the HIE landscape in Ohio, are there a few different statewide HIEs or is there one? Mistretta: No, there’s one central HIE that’s run in Ohio that was set up through a lot of the federal grants. Gamble: But as you said, from a financing perspective, it’s just something where I don’t want to say it’s not a priority, but not worth it right now with all the other costs you have to think about. Mistretta: Correct. The return on that — and these are just arbitrary numbers, but if they’re going to charge me $100,000 to participate in the state HIE and I transfer 10 patients a month, you can do the cost value on that. Gamble: Right. What about accountable care? Are you participating in anything right now? Mistretta: Not yet. We have worked with a couple of payers to negotiate participation in the state insurance exchanges where we would be a preferred carrier for some of them, but outside of that, we really have not. We’ve adopted more of a wait and see where the market is going to be going. We’re fortunate in that we’re pretty much a sole provider in our corridor right now, so we have the luxury to wait and see where some of the stuff goes. Gamble: That certainly makes sense. As far as some of the other big initiatives on your plate, what about analytics? Do you have plans in that realm? Mistretta: We do. We’re doing analytics on two levels right now. The first is more on management from a case management perspective — utilization management, population management and things like that, and so we’re installing some toolsets to work on that space. We’re also drilling down more specifically into the surgical area and seeing what we can do more cost effectively there, since they’re such a big driver of cost and revenue. Gamble: You’re using SIS in surgical, right? Mistretta: Yes. We have an enterprise license for SIS on their surgical system and anesthesia and that runs at both facilities and the surgical center. It’s tied into and integrated with Soarian, so we are exchanging data bi-directionally within those two products. Gamble: So now as far as some of the other big plans on your plate, obviously we’ve talked about a lot already, but are there any other major projects you’re looking at down the road? Mistretta: We’re driving down on revenue cycle quite a bit with some stuff that we’re doing there, particularly an initiative we call physician revenue management, which is preparing basically for the reform payment methodologies, bundled payments, and things of that nature so that we can get all of the physicians on to one billing system, whether they be in the offices or on the inpatient side. An advantage of that from the patient perspective is that we have one patient statement now going out that’s unified for any point of care. So we’re working on that on the revenue side. Clinically, Meaningful Use is the big one, and then of course we’re starting to prepare for ICD-10, which I think most people are looking at that at this point. They’re probably the two biggest things we’re looking at right now. Gamble: Have you started along the road for ICD-10? Mistretta: We’re doing them in tandem with the upgrades we have to do for Meaningful Use. We’re trying to pull the initiatives together. I don’t think people are going to have time to do multiple large initiatives like that unless they’re just an absolutely huge health system where they have multiple staffs. Community hospitals such as MedCentral just don’t have the personnel to do multiple things like that at once. As we start doing an implementation — for instance, the physician documentation changes we need to do for Meaningful Use — we’re wrapping the ICD-10 changes in training for the physicians into that. If I can get the new code sets and the new diagnoses that the physicians need to know and wrap that into a single training session when we roll out physician documentation, I don’t have to go back and revisit that again in the future. We’re trying to combine initiatives as much as we can. Gamble: Right. It’s something you pretty much need to do. Now there’s talk of Meaningful Use Stage 2 being extended — is that something that would affect your plans or do you anticipate that you would kind of keep moving forward as you have planned right now? Mistretta: We would keep moving forward definitely, because we ran into the same situation, if you recall, with Meaningful Use phase 1, where they added the extra year to that. We still went and attested to stage 1 on the first day. That was always part of our plans for a number of reasons: one, we don’t want to re-sequence and lose the momentum that we already have going into this, because we’re only a few month away from being there. Second, there’s also discussion about funding for the Meaningful Use initiative and whether or not they continue it with sequestration and other things going on in congress right now. So better to be on the front edge and ensure payment than be on the back edge after they cancel them. Gamble: Absolutely. With so many things going on and so many things on your plate, one of the really big issues is staffing and being able to hold on to good people. Is that something that’s been a challenge for your organization? We now that we hear from people all over the country who are having trouble either recruiting or holding on to good IT staff. Mistretta: It is, and there are a couple of things going on in that space. I’ve had more turnover in the last year than I have the prior six years combined with the staff. So it definitely is a concern for us. I think one of the issues out there is the amount of demand and workload for the staff. The consulting business has sprung up and probably gotten exponential growth in the last three years—probably more than they’ve ever had historically. One of the things we’ve also done is to take a stand in that space. We do have to use consultants periodically, but I’ve also turned down resources if they were not currently employed by the company and they were being pulled out of other health systems. So we’ve taken a stand in that space as well. I only wish more people in the industry would do that. I think it would solve some of our staffing issues. Gamble: For the staff, I can understand why can see the good parts of consulting, especially when you’re worked really hard and you’re hearing about this different lifestyle you can see how it could be an attractive thing. Mistretta: From an individual perspective, the money has some appeal. However, from an overall health system perspective all we’re doing is inflating our cost if we’re just trading resources amongst each other and buying them back from consultants.